How are those lemons looking? They should be glossy and soft, smell good and lemony, and there shouldn’t be any mold. Are we good? Did we make it? Now try one. Just cut off a bit of the rind, and put it right in your mouth. And that’s what you do with preserved lemons. At least, that’s what I’ve been doing with mine. That’s me in the corner of the kitchen, back turned, hunched over a jar. I’m the one with the entire lemon in my mouth. Of course, like any new ingredient in the kitchen, it can be difficult to know how to use preserved lemons. If you cook Moroccan food regularly, then you’re all set. But I’ve been experimenting with the gold in my jar, and, as promised, I’ve got 3 recipes for preserved lemons to share with you. I’ve been loving all three, but I’ve got to tell you, the third (created out of a moment of inspiration from Joey) is a game changer. I’ll get there in a minute. The flavor of the preserved lemon comes through with a BAM! here, and it’s not for the faint of heart. Make the croutons: Preheat the oven to 350 degrees. Tear the bread into rough, bite-size pieces and toss with the olive oil and salt. Spread on a baking sheet, and bake for 12 to 15 minutes, stirring occasionally. Set aside to cool. 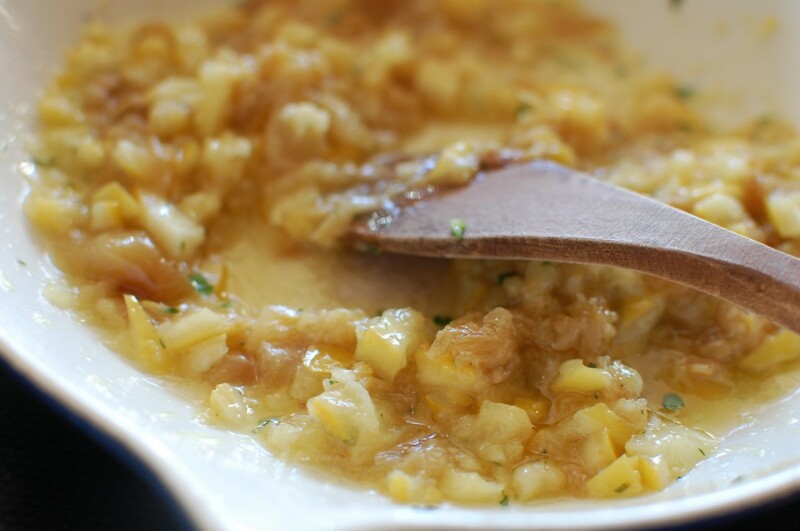 Make the dressing: Combine the vinegar, preserved lemon flesh, garlic, honey, and pepper in a blender. Blend until well combined. Then, with the motor running on low speed, slowly add the olive oil through the whole in the lid of the blender. Stop the motor and add the egg yolk. Blend for a few seconds. Pour 3/4 of the dressing over the kale and toss well. Taste, and add more dressing if you think it needs it. 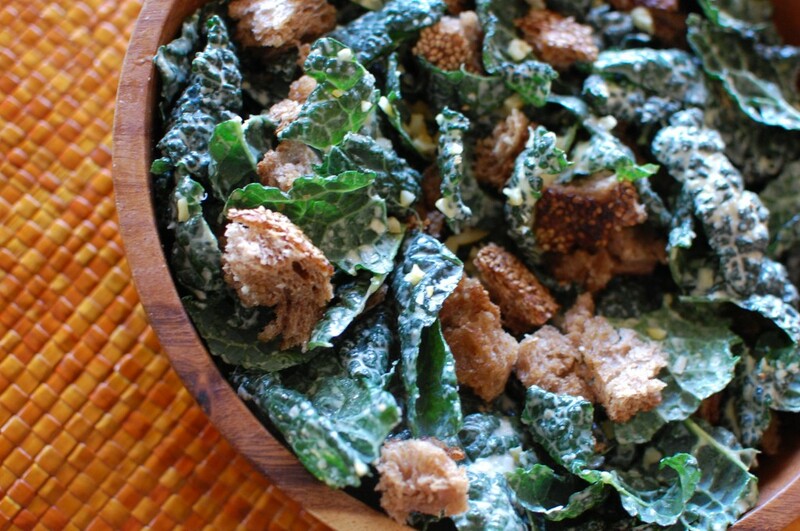 Sprinkle the Parmesan, chopped lemon rind, and croutons over top of the salad and toss again. This next one came to me from my friend, India. She forwarded me an email that had been forwarded to her and on and on. That’s email for you- the game of telephone meets the good old recipe card. It seems that the original creator of this gem is Phyllis. Thank you Phyllis, whoever and wherever you are. We all devoured this dish. 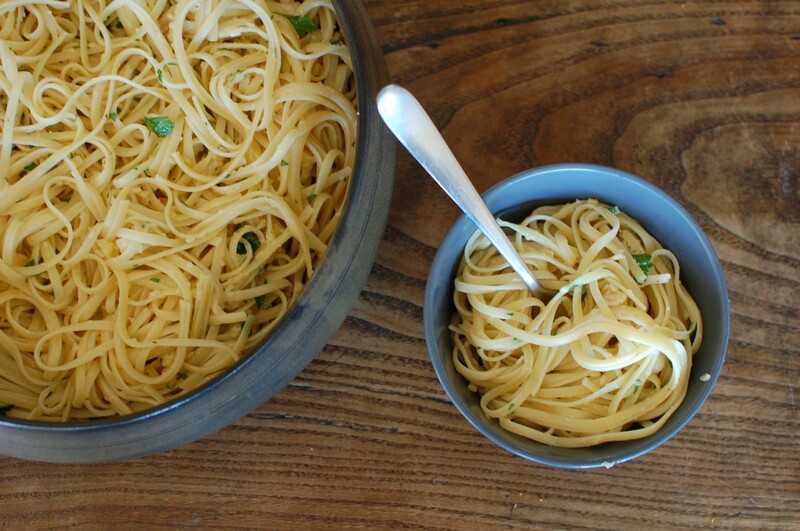 It has enough of the spirit of pasta alfredo that it even meets Rosie’s deepest desires, and the mixture of preserved lemons and roasted garlic is (as a good friend of mine puts it) so brilliant I want to dab it behind my ears. Preheat the oven or a toaster oven to 400 degrees. Chop off the very top of each head of garlic, and remove any excess layers of outer paper. Place each head of garlic on tin foil and drizzle each with a teaspoon of olive oil. Wrap in foil and roast for an hour, or until the cloves are very soft. Cool, and squeeze out the garlic. Set aside. Get a large pot of salted water going, and boil the fettucini until tender and just done. In a medium saucepan or skillet, combine the butter and remaining tablespoon of olive oil over medium heat. When the butter melts, add the garlic and preserved lemon. Cook for about a minute, stirring often. Drain the fettucini, then toss with the lemon garlic mixture. Top with the parsley, ground pepper, and Parmesan cheese, and toss again to combine. I can’t even talk about this one. I just want to give you the recipe so you can make it right now. Combine the lemon, tahini, miso, garlic, cayenne, olive oil, chickpeas, and 4 tablespoons of chickpea liquid in a blender or food processor. Blend until smooth. Add more chickpea liquid if necessary to get to a good, silky consistency. I predict you will taste this to see that it is the right consistency, and then you will eat most of it out of the blender. This is that kind of hummus. And we haven’t even talked about cocktails! Another day then. Another day. Let me know if you discover one, and we’ll swap notes. Hummus? Salad with kale?? Pasta??? Yes! 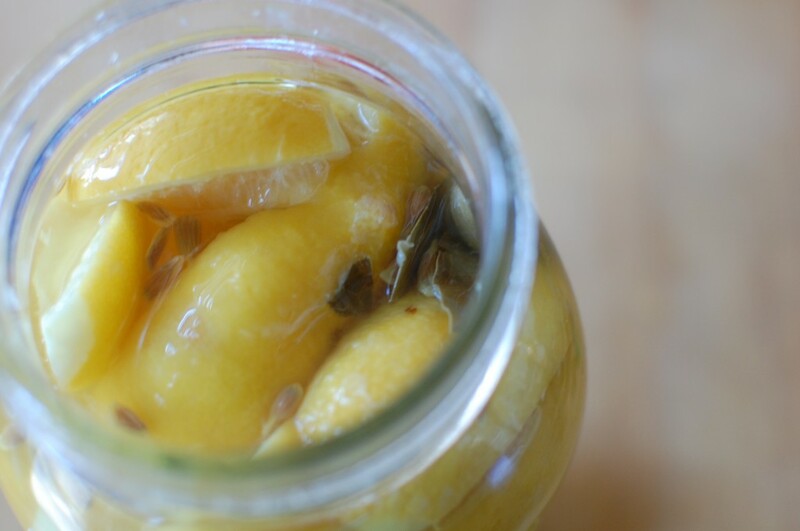 Oooh, I’ve been wanting to make preserved lemons (because they’re so very pretty!) but didn’t know what to do with them . . . Now, I’ll definitely make them and get to work on using them in your delicious recipes. Thank you! I’ve been thinking about making these since your last preserved lemon post and now I am even more inspired. I will make it happen in the next few days! Thanks for the great ideas. Oh, I absolutely love it. The hummus seems so common sense, I can’t believe I didn’t think of it! I also had success with kumquats an key limes. The key limes turned olive green, but they sure pack a punch! This is invaluable because so many times you see “they are versatile,” but a lot of people just don’t cook that way and need recipes. The couscous recipe from Epicurious is a David Leibovitz recipe that I have made a few times, and I can attest to its deliciousness. I wanted to try them in crab cakes last week, but I was unsure if they would be too out there for my guests’ tastes. I can buy preserved lemons at the Whole Foods olive bar, but when you make them yourself they have a much better taste! I made my first batch with too much salt, but it rinses off fine, and they are still much fresher tasting–of real lemon–than the store-bought ones. Can’t wait to try that Caesar dressing, thanks! i just came home and i opened my e-mail and there was your post. i can’t describe how happy i am for these recipes. i have two more preserved lemons in the jar, the rest were used in a moroccan chicken stew and a salad of shredded turnips and beets and i keep searching and reading recipes with preserved lemons and couldn’t decide what to make next. but that sauce with garlic and the hummus are mouthwatering. and accidentally i already have chickpeas soaking in water for tomorrow. and the cocktails… can’t wait to hear about them. That hummus made made my week. Thank you! I think I will make that pasta tomorrow and I am going to wash behind my ears to get ready. And MISO in the hummus. Cannot wait to try that. Love these ideas and am so glad you’re spreading the preserved lemon gospel! I can’t get enough of them. That eipcurious recipe is one of my staples for preserved lemons! I also really like to add them to taboule (sp?). Alana – you inspired me to get up off the couch, fill a jar with lemons and salt, and then wait impatiently for the required three weeks before the jar of joy was ready to go. I opened it last night and popped a chopped up slice of preserved lemon into risotto along with porcini and mozzarella – directing people to your site to make their own preserved lemons. Thanks for the inspiration, and perfect directions. I’m looking forward to your book! Ann, this looks so good! Next on my list, definitely. Thanks for sharing the link. They are so good chopped up in tuna salad or shrimp salad. 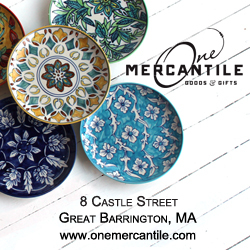 When people ask me what I use them in, I tell them they’re for use in Moroccan tagines, but really, I make them so I can have that wonderful, salty, intense, lemon in my tuna sandwiches. 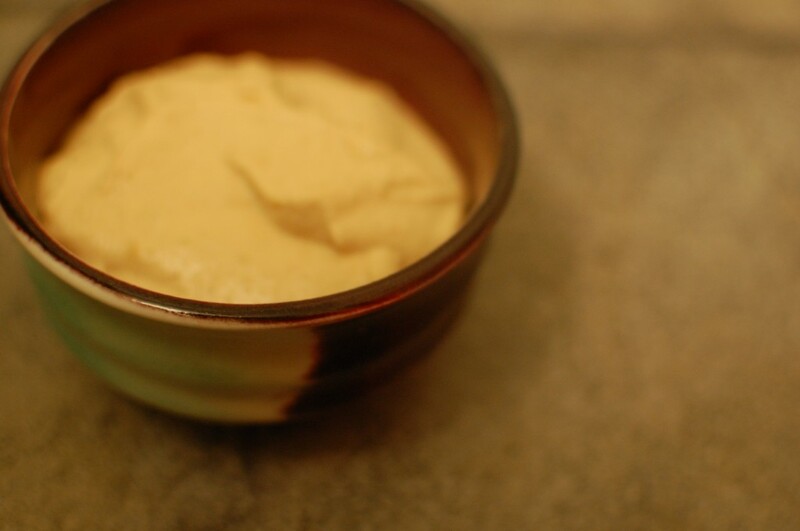 What kind of miso paste do you use in your hummus? Last time I went to but some at our local Asian market, there were so many different kinds, I had no idea which one to buy! I am so in love with the dressing for the preserved lemon Caesar that I keep daydreaming of other recipes to use it in– some kind of grain salad with green beans and tomatoes from the garden? A grilled vegetable salad? I snatched up my daughters plate when she was done and ate the delicious, delicious bits of lemon left on it after the ones on my plate were gone. I want to evangelize and send the recipe to my friends who cook, but they don’t have preserved lemons. I , however, have a jar and a half left! Next I’m going to make that hummus– genius, putting miso and preserved lemons in hummus! Thanks so much for posting these recipes. I’ve been wondering what to do with these delicious morsels. Diana is correct that they are wonderful in tuna and egg salad. I’ve heard of a Vietnamese lemonade, but my attempts weren’t so great. Made a chicken stew with preserved lemons and kalamata olives that was wonderful. I had planned for leftovers for luch — but my family ate it all! In an Indian grocery I found a jar of “sweet lemons pickles.” They are black and gooey and much more bitter than the homemade preserved lemons. How should I use these? Do they need to be rinsed? Sweet lemons pickles- I’m sorry to say that I’m not as intimate with the wide range of Indian pickles as I’d like to be. But they sound right up my alley- anyone else out there have experience with these? It was so good, and I thought I’d look for other recipes using these lemons. Your Caesar looks really good! And.. I’ve got some romaine in the fridge! I just found your gold mine googling what to do with preserved lemons. 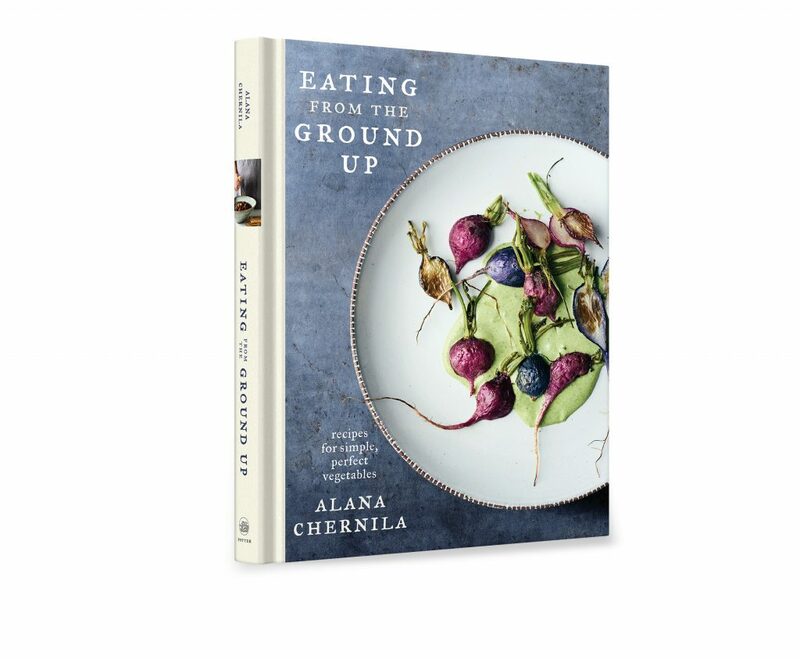 I’m so excited about these recipes. Just got my first ever lemons going. This should be so fun. 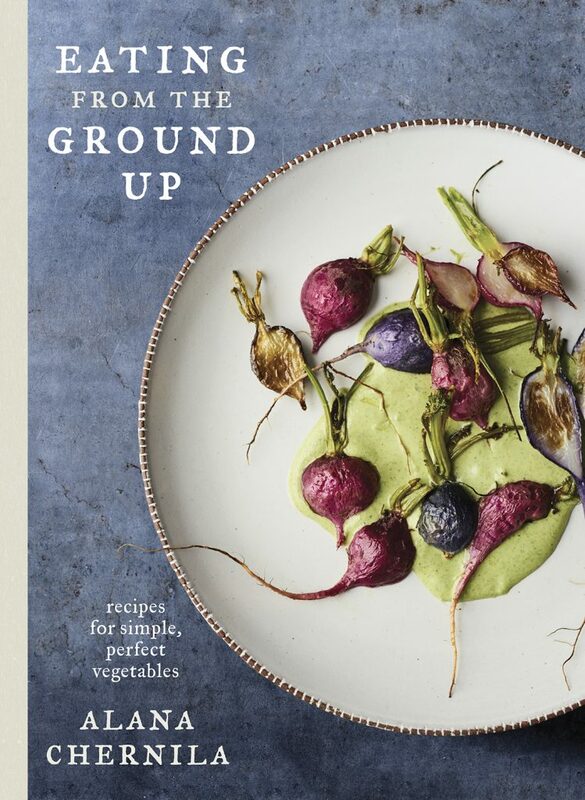 Thanks for some great recipes to look forward to! So I made a few jars of these about a month ago had had them on top of the fridge. I just took them down to take to a food swap and I’m not sure if they are right or not. They taste okay and don’t smell moldy, but there is a little bit of thick stuff in the jar… could this just be something from inside the lemons? I don’t think I’ll take it to the swap and will instead figure something out on the fly, but I am not sure if I botched the preserved lemons. Anyone else had this experience? Hi Cara- What is the stuff like? And are the lemons entirely submerged in the brine? If there’s no mold, and everything tastes and smells ok- then my guess is you’re right- it’s a bit of pulp that’s gathered. But it’s hard to know without seeing the jar–if you’re still feeling uneasy, feel free to send more details and we’ll figure it out. I made the Hummous, its lovely but I found it very salty. I rinsed the lemons, just wondering if i left out the flesh would that make it less salty next time? Hello Caitriona! Yes- if your hummus was too salty for you, you can absolutely leave out the flesh, which tends to be saltier than the rind. Another option is just to reduce the amount of total preserved lemon, taste, and then add more if you feel it needs it. How do you store the preserved lemons once they have been made? Store them in their sealed jar in the refrigerator. They’ll stay good for up to 6 months (or sometimes more!). Ok, so I made the preserved lemons (2 jars) and all looks fine, but when I go to use them, they fall apart! Complete mush. No rinsing of the lemon cause it’s a mushy mess! Is this right? Does this mean they’re bad? They taste like salty lemon no weird taste, so I’m just not sure I did it right… Thanks! Hi Rachel! Total mush, really? I have never had this issue with lemons, but I have with sauerkraut. The culprit there has always been a hot kitchen. Did you leave them somewhere where they would be really warm? Without seeing and smelling them, it’s hard for me to gage their safety, but my personal experience is that unless they’re moldy or smell funny, they are okay.I’d say- go with your intuition if it’s pulling you in one direction. Also, if you used meyer lemons, they can get mushier quicker because of their thin skin. Has anyone else out there ever had a full lemon mush issue? Do pipe in if so! Hi Rachel, More and more now I think there wasn’t quite enough salt in the mix– I’d say that, along with possibly a hot kitchen (?) was probably the culprit. Had the salad and the fettucine last night for dinner. Two excellent recipes! They are going in my permanent files! The hummus I will try today. Don’t suppose you could come up with more vegan options? So glad I found your site. BTW, my preserved lemons are approaching their tenth birthday and they are at the height of their lemony goodness. Thank you for all the receipes. I have a lemon tree and there are so many lemons I don’t know what to do with them all. This year I am going to preserve them and use them in your receipes and keep a look out for for. thank you! 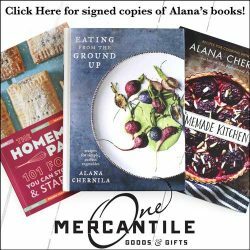 oh, alana, I’m so tickled to find you! i was hunting for recipes to make with some preserved lemons i received as a gift, and i can’t wait to use your inspiration. your writing style sucked me right in, and i’ll be back to visit again. thanks for sharing! I already had roasted garlic I’d made and put in a jar in the refrigerator and preserved lemons I made in September. I didn’t try anything with them yet, then I discovered your recipes. I have made the pasta and it was DIVINE! Next day it was even more tasty!! The hummus got rave reviews from my Arabic friend from Jordon and I loved it also! Nom! Nom! It sets up a bit solid when cold, so thin it well in the blender with a touch of water beforehand. I ate it with sea salt pita chips. I am adding these to my recipe box for sure! Preserved lemons with a recipe card attached is a great, inexpensive Christmas gift also. Thanks for these delicious recipes!! Hi Alana have just discovered your website as I had made a jar of preserved Lemons over a month ago and had no clue what to do with them. Oh, lucky you! I think you’ll be surprised by how useful they are. Happy experimenting, and let me know what you think! 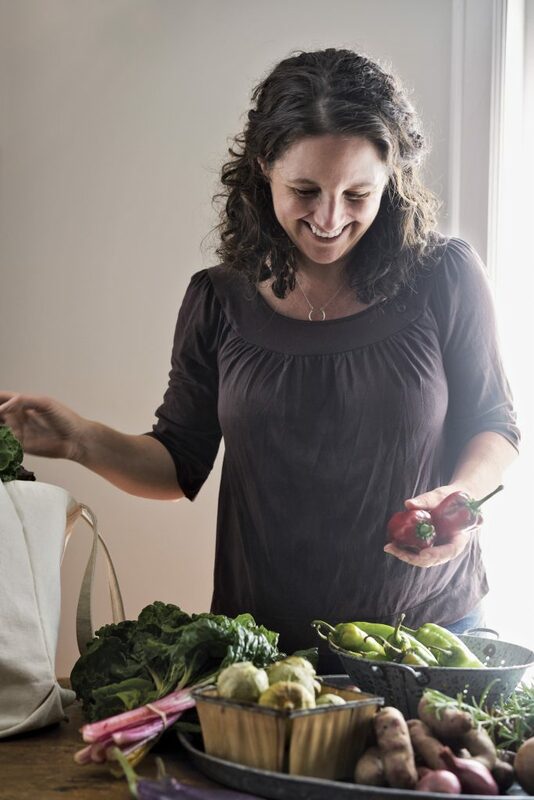 I work for a small scale food producer in Vancouver Canada and love your post. We make preserved lemons and your ideas are right on the mark to tell our customers about how to used these Gems in a Jar. That’s a great idea- like a preserved lemon paste? oooooooohhhhhhhh I’m so excited!! I never heard of preserved lemons before! I grew up in Central America, where you eat lemon/limes on anything. I grew up taking a knife and a saltshaker and gingerly climbing a lime tree, sitting down and eating limes with salt. Talk about yum. So now i’m living in America and my in-laws had a ton of citrus fruit brought in from Pheonix and I was searching for ideas on using all my lemons. I came upon this 3 weeks ago and I AM SO EXCITED!!! I just opened my jar and proceeded to eat 2 slices and my mouth is watering so bad. I am disciplining myself not to eat the whole jar!!! I made mine slightly different, with a Central American twist. Paprika, bay leaves and homemade mango habanero sauce. YUMMMMM. But I have one question. Can I use the juice? Why do some preserved lemon recipes say to wash off the lemon before you eat the flesh? I love the saltiness and don’t want to wash it away! would love to hear your take on why you must wash them. Oh, and i read correctly that you eat the rind and all, right? Preserved lemons can be used on almost any seafood – salmon, crab, clams and muscles, scallops, lobster, and are great in shrimp dishes. I make them and use them fairly quickly. Love them! Mix together, serve on crackers or as mini rollups using white flour tortilla. I preserve my own lemons with half sugar, half salt. Rinse the preserved lemon to remove some of the salt or with the olives, it can be a little too salty. These lemons do look attractive! Those unique Moroccan recipes containing preserved lemons do look appetizing, and these recipes truly look delicious as well! The fact that lemons contain numerous health benefits because of the citric acid present make these recipes even more attractive. Also, The lemons contain “golden” juices which are beneficial, not only to our health, but also to our homes.